What is trash, really, but materials that certain people decide are no longer useful? Scraps of wood, broken furniture and other piece of so-called junk sitting in a dumpster might seem destined to rot in a landfill, but it doesn’t have to be that way. 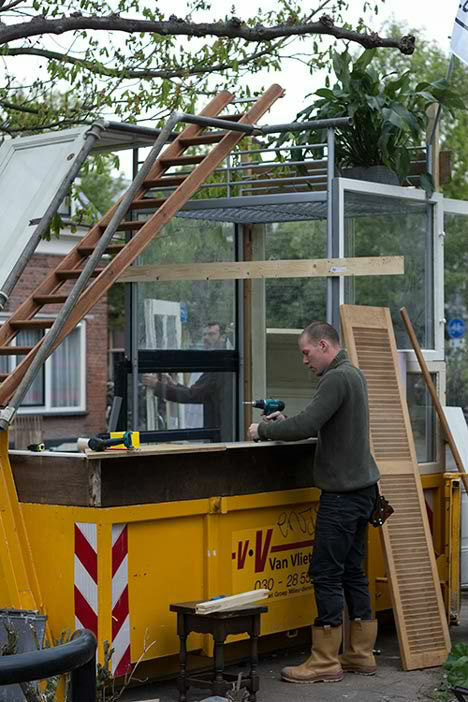 Dutch designers Rikkert Paauw and Jet van Zwieten of Foundation Projects not only transform that trash into useful building materials – they make the dumpsters themselves the basis of miniature bars and cafes. 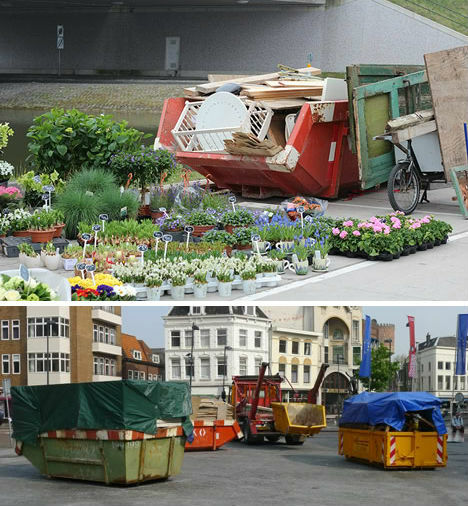 The designers transport the dumpsters to urban locations and then fill them with materials that are either sourced from the streets or other dumpsters nearby, or donated by local residents. 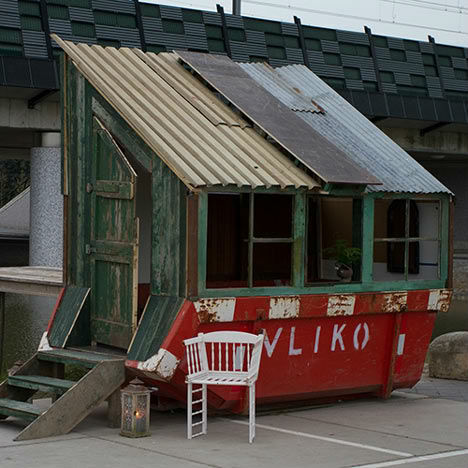 Using the dumpsters as foundations, they build quirky structures that become community meeting places. 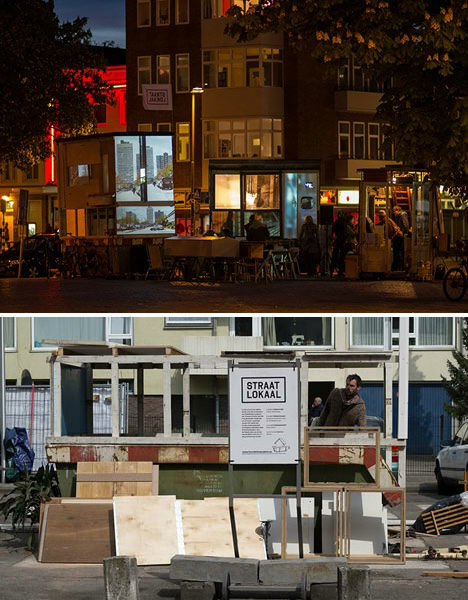 The pair carried out the project at the Vienna Design Week in 2010, the Milan Public Design Festival in 2011 and in their hometown of Utrecht in April 2012, yielding entirely different results each time. One of those structures became a bar called Straatlokaal, which offered breakfast debates, music and speakers from various local districts. The story behind some of the donated materials, like those that came from a renovation or vacant land, was projected onto the buildings at night. 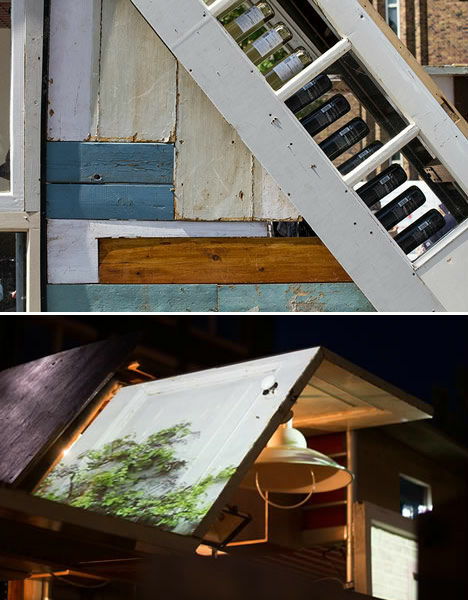 This is just the latest example of innovative dumpster reuse. A project called TrashCam turned dumpsters into pinhole cameras that were used to capture urban scenes. 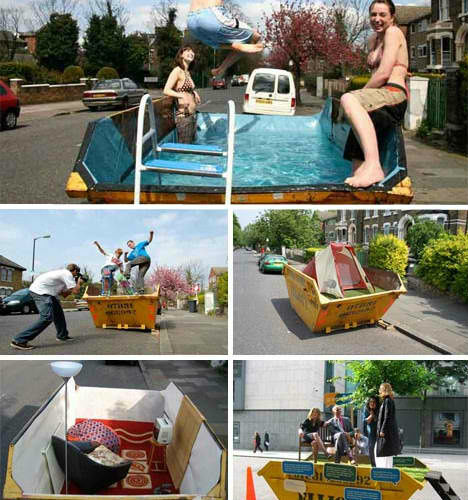 ‘Skip Conversions’ by Oliver Bishop transformed them into swimming pools, skateboard ramps, gardens and public toilets.